A few months ago, a single phone call set off a series of extraordinary events. Angela Jarvis-Holland, NWDSA/ABI Executive Director, received a voicemail from her friend and inclusion ally Samuel Sennott. Sam was in Salem, OR for a conference and learned that demolition teams were tearing down the last remaining buildings of Fairview Training Hospital and Center—a once-booming state institution for individuals with developmental disabilities. After decades of imprisoning “inmates”, many of which were children, and countless instances of abuse and human rights violations, Fairview closed its doors permanently in 2000. Nearly 20 years later, final demolition of the remaining buildings began. Compelled to see the demolition for himself, Sam visited the grounds of Fairview to watch the last of the walls fall. Moved by what he saw, Sam called Angela and left her a heartfelt message about the experience. Angela shared the voicemail with her husband Steven and her 19-year-old son Daniel, who experiences Down syndrome. Steven suggested they visit the grounds of Fairview to see the demolition. Dan asked if his friend Eddie, who also experiences Down syndrome, could come along. They got in the car and headed for Salem. On the way, Angela asked Dan and Eddie if they would like to watch an old black-and-white film about Fairview, warning them that it showed images of kids like them living in repressive conditions. Angela explained that understanding the history of how individuals with developmental disabilities were treated in the past is important but can sometimes be upsetting. Dan chose to watch the film; Eddie declined. When they reached Fairview, Angela and Steven took photos and videos of Dan and Eddie exploring the grounds. Dan leaned against a gated fence and spoke about the injustice and shame of places like Fairview. Dan said that learning about the survival of kids like him in Fairview makes him want to be a strong man and a strong advocate. Angela was deeply moved to see her son leaning on the gate and speaking about being a “strong man” knowing that, had he been a Fairview “inmate”, he would never have been able to pass through that very gate. The family collected some pieces of rubble from the demolished buildings to bring home as reminders of the history and progress of disability rights. As they were leaving the grounds, they approached the sign at the entrance—now covered with boards and concrete. Angela mentioned that she happened to have a bucket of chalk in the trunk of the car. 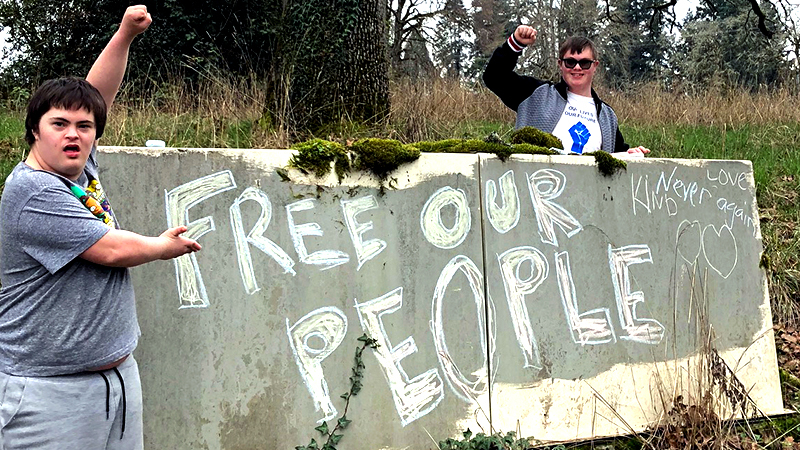 They stopped, got out, and drew in giant letters the words “Free Our People” where Fairview's sign used to be. Dan wrote “kind”, “love”, and “never again”. Later, Angela shared the photos and videos, as well as Sam’s voicemail, with members of the Social Justice Youth Program—a project of ABI made up of young adults with disabilities and allies including both Dan and Eddie. The group coordinators—Aniko, Megan, and Rachel—had the idea of creating a video out of the footage and photos. Members of the Social Justice Youth Program recorded additional footage, including interviews with Dan’s brother Quinn and disability rights historian Michael Bailey. They wanted to know more about the history of disability rights. What the group noticed is that, while it’s true that the civil rights and inclusion of individuals with disabilities have come a long way, as symbolized by the demolition of Fairview, many ‘invisible barriers’ to inclusion remain and those like Eddie and Dan face these barriers nearly every day. 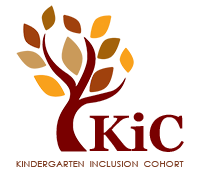 The video premiered at the 2018 All Born (in) Cross-Disability Educational Inclusion Conference. And the final piece of the story—Youth Program members created awards out of the pieces of rubble that Dan and his family collected during their trip to Fairview. At the end of the All Born (in) Conference, the group presented these “Breaking Barriers” awards to members of the community who advocate for inclusion and make a difference in a very real way.